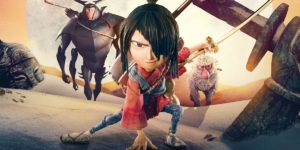 Magic, mystery and art are woven into a heroic Samurai tale in the new film, Kubo and the Two Strings. This action adventure story takes us on a dreamlike journey through ancient Japan. It’s visually stunning with a blend of stop motion animation and CG techniques. The film’s heartfelt messages about kindness, compassion and finding one’s own path in life add emotion and drama. Kubo’s serious quest is punctuated by some laugh-out-loud moments. Here’s the official trailer. Produced by Laika stop motion studios, directed by Travis Knight, written by Marc Haimes and Chris Butler, it debuted on August 19, 2016. Art Parkinson, Charlize Theron, Matthew McConaughey, Ralph Fiennes, Rooney Mara and George Takei lend their voices to the film. 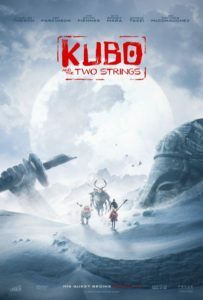 Kubo, a young boy, climbs down from his mountain cave home where he lives with his mother to dazzle crowds in town with his dramatic story telling each day. He conjures up origami characters that come to life as he plays his shamisen. His inventive tales center on battles that Hanzo, his missing Samurai warrior father, wages with monsters. The stories spin out of control, and Kubo goes on a classic quest to find the magical armor that will allow him to defeat vengeful spirits from the past. The film is getting great reviews. It’s fun for the entire family. Check it out! Gumby and The Little Prince have a few things in common, so it was with great anticipation that we watched The Little Prince feature film on Netflix on the opening night in the U.S. this month. >>Watch the trailer. The film is based on the famous and timeless French novella, The Little Prince (published in 1943), which is one of the best-selling books of all time. The film is beautiful. This adaptation captures the wondrous spirit of the book with an amazing blend of stop motion animation and CG artistry. 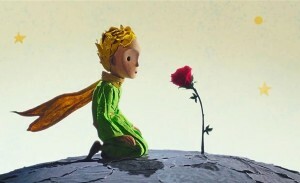 Gumby creator Art Clokey was acquainted with Antoine de Saint-Exupery, the author of the The Little Prince. Antoine was a pioneering aviator who had recounted his aviation experiences in the Sahara Desert in both his memoirs and in The Little Prince. Art Clokey was a reconnaissance photographer in World War II, stationed in North Africa. He had some similar experiences as Antoine, and even met him in the early 1940s. Art told us that the Gumby episode “Small Planets“ was loosely influenced by The Little Prince. You can see the kindred spirit of the little girl’s yearning for imagination, fun and adventure in Gumby. Jumping forward to 2014-2016, our very own Gumby Animation Director Anthony Scott served as lead animator on The Little Prince. 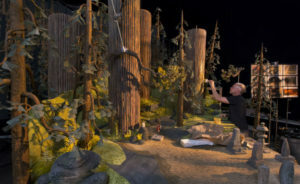 Anthony got his start as a stop motion animator in the late ’80s when Art Clokey hired him to work on the Gumby series. Anthony has gone on to work on other amazing stop motion films such as James and the Giant Peach, The Nightmare Before Christmas, Coraline, Corpse Bride, Paranorman, and many more. “The Little Prince was a once-in-a-lifetime project that I was fortunate to be a part of. Since I was a child, I was familiar with the book, especially its strange and fascinating illustrations. Our core team including Jamie Caliri (Stop Motion Creative Director and founder of Dragonframe stop motion software) and Alexander Juhasz (Stop Motion Production Designer) and myself, set up a small studio in Montréal, Canada. We put together a top-notch crew of local talent to produce the stop motion sequences in Mark Osborne‘s film. Read more about the Little Prince here.